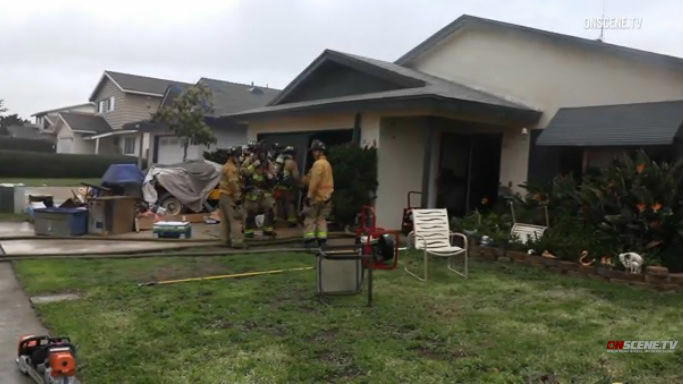 One child and four adults were displaced this morning when a fire erupted in the garage of their Otay Mesa home, authorities said. Photo via OnScene.TV. A portable heater being used too close to flammable materials in the garage of an Otay Mesa house sparked a fire Monday that displaced five residents. The non-injury blaze in the 800 block of Narwhal Street was reported about 7:15 a.m., according to the San Diego Fire-Rescue Department. Firefighters were able to get the flames under control within five minutes, SDFRD spokeswoman Monica Munoz said. The American Red Cross was called in to help the four adults and one child who live in the home arrange for interim housing. Updated at 11:33 p.m. Feb. 4, 2019.